Why Poetry, Painting and Music? After studying, creating, teaching and researching Chinese painting, music and classical Chinese poetry for 14 years, traveling in 11 countries in Europe, Australia and North America, teaching in 39 American and 2 Chinese organizations (K-12 schools, art centers, universities, libraries and a church as a volunteer teacher and instructor 223 times for more than 300 hours, face to face and online 252 times), holding art exhibition 6 times in the US. studying at 8 universities (majoring in Chinese Language and Literature for a Bachelor degree of Arts for 5 years and teaching College Chinese as an instructor for 9 years, majoring in Chinese painting at the Chinese National Academy of Arts and the China Central Academy of Fine Arts for 8 year (2010 to 2019) for the second -- Master degree of Fine Arts), painting more than 1200 Chinese painting, creating 178 piece of music, translating 136 articles from English into Chinese with 0.9million words and 350 Chinese poems and lyrics from Chinese into English and publishing 2 series consisting of 6 books, 4 CDs and 2 DVDs, and donating whole of the income from all the exhibitions and offering painting tools (paper and brushes, sometimes colors) to more than 4,000 students... a unique Cross-Culture and Comprehensive Art, which is focused on Chinese poetry, based on Chinese painting and be assisted by music has emerged. E-bridge Cross-Cultural & Comprehensive Art and Its Project is an interdisciplinary system, which consists of a Chinese culture and art product series and an American culture and art product series, an online flat form and a business management system. It uses Chinese classical poetry as the joint point to combine traditional Chinese painting, modern Chinese language and music for creating and adding a new subject in the fields of Chinese as a foreign language and Chinese cultural transmission, and a unique art form in pure art field. In the field of Chinese for foreigners, it is “Poetry, Painting, Music: Comprehensive and Artistic Chinese” and lays particular stress on Chinese language; in the cultural transmission field, it is “Together With Me, Learn Chinese Culture and Language by Enjoying and Practicing Paintings, Music and Poetry”, and lays particular stress on Chinese culture and its practicality (and then aims to do the similar things with other cultures and arts) ; in the pure art field, it emphasizes its attribute as a comprehensive art. 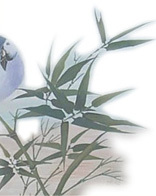 Based on the combination of Language, Culture and Art, which is together with traditional Chinese painting itself and the stories behind these paintings, it forms one “wing” of E-bridge cross-cultural and comprehensive art system, they go with the other “wing” which creates something similar for other nations’ languages, cultures and arts. The first purpose of E-bridge Cross-Cultural and Comprehensive Art is to help non-Chinese speakers to learn Chinese culture, language and arts by enjoying and practicing Chinese painting, poetry, music, calligraphy, Chinese characters and stories behind all of these cultural and art phenomena, to make the process of studying a foreign culture and language more natural, easy and artistic. Its second purpose is to help non-English speakers to learn western cultures and English. E-bridge cross-cultural and comprehensive art project should consist of a series characteristic products and services, and be supported by a platform. It is started from China, grew up and is based in the USA and will be extended to Australia and Europe. Its dissemination channel is multi-media and face to face; its main work is creating, teaching, research and business. Anyway, since Chinese poetry, painting and music belong to different art fields, how can E-bridge Cross-cultural & Comprehensive Art connect them together? And why are they the main pillars of this art project? In fact, among them, there is a ready art which can connect them and many more arts naturally. It is just Chinese classical poetry. I. Chinese Painting Is a Comprehensive Art Which Assembles Multiple Arts Together, Among These Arts, Poetry Is Their Core. Chinese painting is a comprehensive art which consists of poetry, calligraphy, picture and stamp on the surface, and carries the music, language, Chinese character and cultural background within. Among these arts, poetry is their core and leader. All of these arts should serve for the poetry or for reaching and meeting the poetry. In this sense, poetry is the core of E-bridge Cross-Culture & Comprehensive Art and its project. -- Theoretically, since the Tang Dynasty (618 �C 907), Chinese artists have followed the aesthetic viewpoint “There are paintings in a poem; There is poetry in a painting”. All of the efforts and the materials on a Chinese painting must serve to express the poetry, but initially poems were seldom written on paintings and it wasn't until the Song Dynasty (960-1279) that poems started to be written on paintings, and be started as a new kind of poems �C Ti Hua Shi. Writing poems on Chinese Paintings was something that developed in Qing Dynasty (1644-1911). Now it is a usual art form. -- Calligraphy is not only a method of expression of Chinese poetry (when a poem was written), but also it is a Chinese painting’s drawing method and principle. A good Chinese painting should be “ written out ”, instead of being “ painted ” out. In a good Chinese painting, every stroke, even a little point of Chinese painting should be written out, using the processes of Chinese calligraphy, such as Beginning, Going on and Stopping. -- When a Chinese poem is expressed by calligraphy, the words of the poem are turned into Chinese character of modern Chinese language. When people write a poem on a Chinese painting, they are in fact writing the “ Words” �C characters of modern Chinese language. -- When a Chinese poem is expressed in sound, such as recitation in mandarin, the words of the poem are turned into Chinese pronunciation of modern Chinese language. When people read a poem on a Chinese painting, they are in fact reading the pronunciation of modern Chinese language. -- Chinese characters on a stamp are the original shapes of the Chinese characters of modern Chinese language. Stamp is one of the important elements of a Chinese painting and has been used for about 1400 years, the Chinese characters on the stamps are mainly Dazhuan -- large seal style -an ancient style of calligraphy current in the Zhou Dynasty (11century B.C.－256 B.C. ), Xiaozhuan �CSmall seal style/script -- adopted in the Qin Dynasty for the purpose of standardizing the script or Jinwen -- inscriptions on ancient bronze objects. Stamps have been used on Chinese paintings from the times of Emperor Yuan �C Xiao Yi (508 -- 555) of Liang Dynasty（ 502-557）in the Southern Dynasties (420-589). -- Poetry in Chinese is Shi Ge (Poem Song) and ancient Chinese poems could be sung, Ancient Chinese poems are in fact the lyrics for music. No matter whether the first poetry collection, Shi Jing ( B.C.11th to B.C.7th centuries), or Chu Ci ( 475-221 B.C), Han Yue Fu (206 B.C.- A.D. 220), Tang Poetry (618 -907), Song Lyrics(960-1279), Yuan Verse (1271-1368) … all of them were expressed by reciting with vocal music or instrumental music. Chinese poetry history is also a history of Chinese music. However, over time, most of the music has been lost. -- Most of the primary words of modern Chinese language were recorded and preserved by ancient Chinese poetry, and they are the root words of modern Chinese language. -- Every ancient Chinese poem includes some stories and these historical stories are something that relate to Chinese culture. In summary: Since Chinese painting is the combination and carrier of poetry, calligraphy, picture, stamp on the surface and music, language, cultural background behind; since poetry is the core of Chinese painting - it is expressed by picture and calligraphy from a visual angle, by music from auditory angle, by primary words characters from a language angle and by story inside from a cultural angle - when people write poetry, they are in fact writing the primary words of modern Chinese and calligraphy art; when they read a poem with the right tones, they are in fact learning Chinese pronunciation and poetry and language arts; when they are moved by the stories inside, they are in fact learning another culture. When they are painting a Chinese painting, they are enjoying and learning all of the multi-arts at the same time. When they are given an explanation and showed these in English, they are touching and learning Cross-cultural and interdisciplinary art. In this sense, to learn Chinese culture and language by enjoying and practicing Chinese poetry painting naturally, easily and artistically, should be one of the best methods. II. Both Chinese Classical Poetry and Vocal Music Are Melodic Language, Some of the Same Physical Characteristics Lay a Foundation for People to Teach or Learn Chinese language Through Singing. The first Chinese poetry collection Shi Jing (11th Century B.C. to 6 Century B.C. ) was sorted according to music: Feng -- folk song, Ya �C scholar’s song and Song �C royal or imperial court’s song. Later forms of poetry, no matter whether Han Yufu (202 B.C. to 220), Tang Poetry (618―907), Song Lyrics (960 to1279 ) or Yuan Drama (1271 to 1368), also could all be sung. However, over time the music parts have been lost. Although music and language are different arts, to a good singer and a speaker who has been trained professionally, the action in his mouth and the direction of the air current should be the same. The difference between a untrained speaker and a professional singer is in their sounding points, that is, the localities of sounding are different. The sounding points of a professional singer, or a speaker who has been trained professionally should be higher than a general speaker’s. Meanwhile, a singer’s mandibular joint should be opened wider than a general speakers, to force the air current to be “ hung ” on his nose and to send his sounds out from his nose instead of his mouth, if this position of sounding is higher, the result will be better. During the process of singing a song, the singer’s abdomen should work as an “engine” or “bellows", to offer power for pushing or controlling the air current and sounds of the singer with different degrees. While the use of various techniques to hold the position of sounding by opening the mandibular joint, controlling the direction of the air current and not touching throat while using the power of abdomen to control the breath is certainly the business of music, the basic style of speaking Chinese and singing Chinese songs are same. If someone is a good Chinese singer, he can certainly be a good Chinese language speaker, but a good Chinese speaker is not necessarily a good singer of Chinese songs. With this idea, I have been creating music for Chinese poems since 2005 and the result of teaching students to sing the poems on my Chinese paintings in both of USA and China has proved welcome and a good way to help non-Chinese speakers to learn Chinese language and how it relates to the exotic culture and (its?) arts. III. Ancient Chinese Poetry Is One of the Main Carriers of the Basic Primary Words of Modern Chinese and These Basic Primary Words Are the Ties Between Ancient Chinese Poetry and Modern Chinese Language and Vocabulary from a Linguistic Angle. -- Between Chinese classical poetry and modern Chinese language, there is something the same. This is just the small number of basic primary words / basic vocabulary which are the etyma /roots of about one hundred thousand items of modern Chinese vocabulary; In about 90,000 Chinese characters of modern Chinese language, there are only about 500 or 901 or 2330 primary words /characters (there are different versions of this number). -- Most of this basic vocabulary was created in ancient China and was recorded in Chinese classical poetry and articles over several thousand years. Since classical Chinese poetry is one of the most important carriers of primary words or basic vocabulary of model Chinese language, then, classical poetry is one of the best methods of mastering this root vocabulary and of learning modern Chinese language. With these thoughts, I came to believe that to learn Chinese culture and modern Chinese language via learning Chinese ancient poetry by enjoying and practicing Chinese painting, music and poetry is one of the best, most natural and most accessible methods. Therefore, E-bridge Cross-Cultural and Comprehensive Art has chosen Poetry, Painting and Music as the three pillars of its creative system. The publication in your hands is just one of the results of my study, research and exploration. If you have any questions, comments and suggestions, you are welcome to write to shirley@ebridge.cn or leave a message on www.ebridge.cn. I would be very happy to hear and follow your good advice with a big smile.